There is a lot of good that comes with being an early adopter, but there is a lot of bad as well. When it comes to flat beds in business class, British Airways and Virgin Atlantic were both early on the scene. That meant travelers flying both airlines flew what were then leading products, but it also meant that other airlines had plenty of time to surpass their initial efforts. Though both airlines had refreshed their products, there wasn’t really an enormous push to reinvent the wheel. After all, when your primary hub is slot-constrained Heathrow serving business-rich London, even a dated business class will outperform how it would do elsewhere. After nearly two decades, both of these airlines have now chosen to do something brand new, and they launched their seat within a month of each other. Each will fix the flaws of their previous seats, and both are taking two different approaches to design. In the interest of full disclosure, I must note that I was supposed to be in London for the rollout of the Virgin Atlantic seat this week, but instead of settling into my Upper Class suite courtesy of Virgin Atlantic on Saturday, I found myself settling into a much less comfortable seat in the waiting room of my local urgent care. A nasty head/sinus/energy-zapping thing kept me in bed for a few days, and I was sad to miss it. When Virgin Atlantic rolled out its first true flat bed in 2003 (it had installed angled flat beds in 2000), the seat was a big deal. The unique herringbone design allowed travelers to sit at a slight angle, having their backs toward the window and their eyes peering into the aisle. It was private on three sides (not the aisle side), and it gave every traveler direct aisle access, but a far superior design would have been to have travelers turn their backs on the aisle and face into a more scenic window view. That “reverse herringbone” design has become an industry standard. Further, while Virgin did introduce a fully flat bed, it was clunky. Unlike most seats, the seat couldn’t simply recline into a bed. It required flipping the back of the seat over to create the flat surface. This sounds great in theory, but it was a lot of work and it was disruptive to the traveler. Time has shown that this isn’t a preferred way to build a seat. 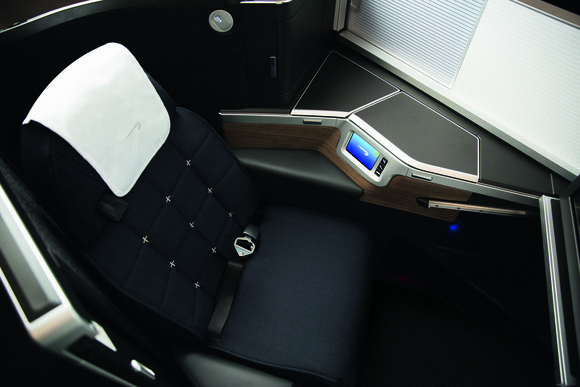 In , the airline has adopted the reverse herringbone design and the seat now fully reclines into a bed. Problem solved. Judging from media response, however, there are still complaints. Apparently all business class seats must now have doors or they aren’t considered worthy. I don’t understand this myself, but this seat has a half door, if that, so it has already received some criticism. Virgin says it doesn’t want to close people off entirely, and this is about being social. This also fits with the theme in the new “Loft” area where 8 people can stand and sit and have drinks. It’s an updated version of the bar into more of a lounge area. If you look at the layout of the aircraft, the Loft sits at the primary entry door, between Upper Class and premium economy. The Loft area takes up what would probably be a galley on most aircraft. But Virgin Atlantic puts a great deal of importance on having this social space. That seems to be the overall theme of the design. Contrast this with what British Airways has done. BA introduced its first business class flat bed in 2000 when such a thing was truly revolutionary. But the seats introduced in 2000 also had their flaws. Notably, there were 8 seats across on the 777 or 747 (downstairs). That means only half the seats onboard had direct access to the aisle. Further, the seats alternated facing backwards and forwards. While I never had a problem sitting backwards and even found it novel, others did. The original seat had very limited storage as well, but that problem was alleviated in later revisions. BA held on to its dense configuration for years, and it’s hard to blame the airline for it. Density meant there were a lot more opportunities to put people on those planes. But eventually, change had to come as even its own partner American surpassed it (and by a lot). Like Virgin Atlantic, when it goes into service later this year. The new BA seats are indeed suites with doors. They are reverse herringbone in design and they look sharp with their dark colors. The unfortunate thing about this and all current generation seats is that they aren’t very family-friendly. They are designed for the individual business traveler, which is unsurprising since those are the people who spend all the money (or, at least, their companies do). I’ve seen some people react with disappointment that neither of these airlines have stepped up to roll out something revolutionary. It’s hard to imagine why BA would want to do that. Clearly it saw the numbers and realized it needed a competitive product, but did it need a revolution? No. It could continue to serve its London travelers well with something that didn’t leapfrog the competition. I’m somewhat surprised Virgin Atlantic didn’t try something more revolutionary. After all, its partner Delta across the Atlantic was one of the first to put a door on a business class suite, and playing second fiddle to BA means trying to keep one step ahead of them. But Virgin has chosen a safer, more social path. That’s not to say this is a bad decision by Virgin. Some may nitpick about minor things, but overall, these products look to be excellent entries into the market for both carriers. Very good take – and I think a lot of the criticism of VS for not doing something more revolutionary is justified.. The product looks good but with a limited fleet/route map and a quirky boutique brand you’d think they would have worked harder to get one up on BA. One more point to make though is consistency. BA has admitted this will be a problem and that rollout will take ~4 years across the whole longhaul fleet. Virgin however has not committed to rolling out the new product across the fleet at all. Their 789 aircraft were delivered new with the old herringbone product (a strange choice) most of the A330s have just been refurbed as well. The 744 and 346 aircraft are do to be retired soon. This means that, for up to a decade (! ), only a minority of the VS fleet will have this new seat, which just doesn’t sound like a consistent or competitive product (especially once most/all of the BA fleet has been retrofitted). The UK does have a high premium cabin tax, but it only gets charged on itineraries originating or terminating in the UK, not connections to Europe. Most of the “taxes and fees” on a BA-operated mileage ticket are airline YQ fees (formerly known as fuel surcharges but they had to stop calling them that when the surcharges never went down when the price of fuel went down). That’s really just cash that goes to the airline, not a tax that goes to any government agency or a fee associated with any regulatory cost or anything like that. You can avoid them by using AA miles on other carriers (mostly AA), but award availability on other carriers is poor in large part because they don’t have the many hundred dollar effective copay. The higher level GB tax is only charged on departures from the UK, not connections through it. You might be confusing the fuel/airline surcharge (aka YQ) with a tax. It is not. Various airlines collect it on award tickets. Get the small things right? Like spelling perhaps? BA have said they are now deep cleaning the cabins more often, and they already announced other improvements to First and Club World very recently. Looks like a nice way to fly. pink colour ???? light colours bring a feeling of warmth & comfort ?? ?yeah ?? I just flew Virgin Atlantic in Upper Class from DC to Johannesburg via London round trip. I was a little hesitant about the herringbone seat, but the fare was too good to pass up. Actually, the fare was the same as BA (but way cheaper than the “direct” IAD – JNB flight on SAA), but BA would have charged me and my partner an additional $500 earch/ $1000 total to select seats for our flights, so that was a non-starter. Overall, while the seats were not great (but still comfortable and I did manage great sleeps on all of my overnight flights), i LOVED Virgin. This was my first time flying them, and I’d happily do it again. There was just a great energy to the crews on all 4 segments. The lounges at Dulles, Heathrow, and Johannesburg had great food and drink selections. Plus the service on board all 4 flights was just perfect and the food options interesting and delicious. I loved it, and would definitely do them again. I’m excited to see the new seats. While I know it’ll take awhile until they are deployed on a fleet-wide basis, I think they will be great and the lack of a full door will not bother me. Cheers, Virgin! I remember reading pundits who would complain because the airlines’ offerings were too similar. Now, they seem to complain when carriers do something that differentiates their offerings. By the way, I do like the lounge idea. This week I experienced the worst Club world experience ever, cabin crew had not finished school, terrible service, awful food and wine and total disinterested staff. Cattle class on Mango airlines (domestic airline in South Africa) are better! How many 787’s does VS have compared to it’s 350 order? Am I crazy or is the VS product not a true reverse herringbone? Window seats tilt towards window. But middle seats tilt towards aisle. So half herringbone and half reverse herringbone (what the heck is the term for that?). I can’t tell the value of that (or the problem with it) from the photos — but haven’t seen anyone explain what this seat is vs. the others as it does appear to be different. VS – If I had been there this week, I could have told you in great detail! I would go with “parallelingbone” because the seats on each side of the plane are parallel. For VS, I wonder if they are a little less revolutionary as they don’t want too dramatically different a product that DL. Personally, I’m not entirely sure what can be done in “revolutionary” fashion at this point in terms of a business class lie flat seat without going to a true 1st class experience. Doors vs 1/2 door vs no door isn’t particularly a revolution IMO. The best thing any airline can do for their business class is stop letting people upgrade. Either pay the full fair or sit in coach. I’m sick of seeing people who clearly do not belong there in business class taking up the space of those of us who pay full fair. Amazing what misuse of a language does to others’ perception of what you’re attempting to communicate. Depends on the rewards scheme. For example Qantas Frequent Flyer Division is more profitable than its international aircraft operations. So, maybe those upgrades are paying just as much as the direct fare paying passengers. I qualify that by saying I don’t know if BA and Virgin run their FF programs as profitably as Qantas. Biff….. Buffy is calling you! Your tee time has moved to 11. TA TA! I really don’t get what people want when they say ‘revolutionary’ without mentioning anything more that one would want. It just sounds whiny. What is supposed to be revolutionary about a seat anyway?